Special Olympics Louisiana (SOLA) is a state wide not-for-profit 501©3 organization that changes lives by promoting understanding, acceptance and inclusion between people with and without intellectual disabilities. We provide sports training and athletic competitions and we transform lives through the joy of sport, everyday, everywhere. Currently, 14,880 children and adults with intellectual disabilities in Louisiana participate in over approximately 100 competitions. We are also a global social movement. With initiatives to activate youth, engage kids with and without intellectual disabilities, build communities, and improve the health of our athletes - we're changing the game for people young and old and asking you to be a part of it all. Special Olympics Louisiana has over 15,000 dedicated and generous volunteers in Louisiana that contribute their time and expertise to help us reach as many athletes as possible. We must be self-sufficient in raising $2.8 million this year. 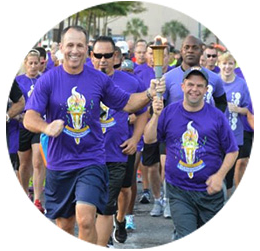 Special Olympics Louisiana relies upon the generosity of corporate and individual donations, sponsors, civic groups, foundation grants and special events to fund programs. The mission of Special Olympics Louisiana is to provide year-round sports training and athletic competition in a variety of Olympics-type sports for all children and adults with intelectual disabilities, giving them continuing opportunities to develop phisical fitness, demonstrate courage, experience joy, and participate in a sharing of gifts, skills and friendship with their families, other Special Olympics athletes and the community.